"To know that we will own such a well-built home is a great source of comfort to our family. I am so grateful to the community that built this home, and to Habitat for Humanity Mid-Vancouver Island for providing this legacy for my daughters. We are all so thankful and so happy." This home was originally built by Habitat for Humanity Mid-Vancouver Island in 2009. 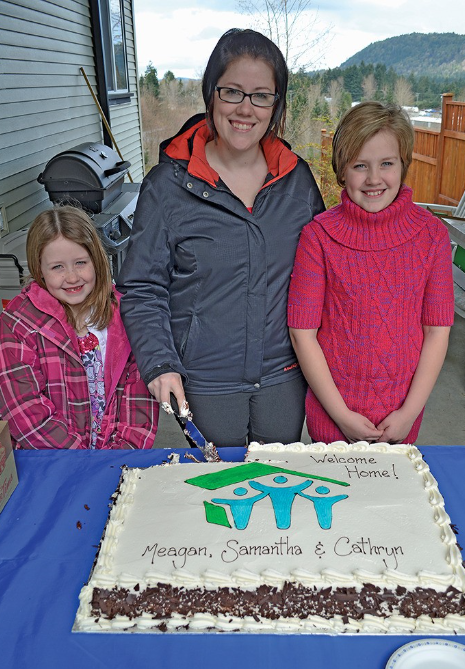 In 2012, the homeowner got married and decided to ‘pay it forward’ by returning her home to Habitat Mid-Vancouver Island, so that another family could benefit from the Habitat homeownership program. Meagan, a single mother and her two children, were chosen as the future homeowners. The apartment that Meagan rented was not well managed. In the four years that she and her daughters lived there, the apartment was infested twice with bed bugs, as well as rats and cockroaches. There were numerous outages of hot water and heat in the entire building and in the public areas, many tenants smoked marijuana. The family then moved to another apartment complex which forced the residents to move out while they renovated the apartments, and then would force them to pay higher rent. Once again Meagan and her children moved, but to get a three-bedroom rental, the rent was much higher.